Read, quiz and read some more! Holy Cross is encouraging pupils to read, quiz and read some more! 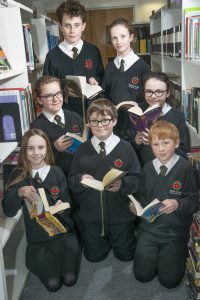 The Accelerated Reader Programme has proved a popular addition to the library calendar over the last few years and the school has a large number of word millionaires. Thirteen more have just added their name to the list with Year Eight Joe reading nearly 2.5 million words since starting school in September 2017. Joe has passed 23 quizzes and was the first in Key Stage Three to hit a million words read. There are six new word millionaires in Year Eight, one new word millionaire in Year Nine, Leah, and six word millionaires in Year Seven, including Charlie who has read and answered quizzes on 28 books so far. “I am currently reading Angel by LA Weatherly about a girl who is half angel,” said Charlie, who was the first in Year Seven to reach one million words. “My favourite author is Rick Riordan, who writes the Percy Jackson series.